The iconic brownstone row houses occupy a special place in the New York psyche. Like the Brooklyn bridge, yellow cabs and $1 pizza, they’ve come to define the classic image of New York. They’re also madly expensive and can stir teeth-baring jealousy in everyone who wants one. You can find thousands of these structures on streets all over the five boroughs. All of them stacked up like glistening expensive pancakes. For many New Yorkers, these stately homes with their regal banisters, and elegant doorways are the symbol of upward mobility. But how did they first come about? What is it about this innocuous chocolate-colored stone that makes it so ubiquitous and desired in the city? Let’s jump into a little bit of NYC history and find out. Where did NYC brownstone come from? 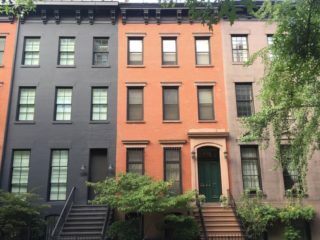 How did brownstone become so popular in NYC? 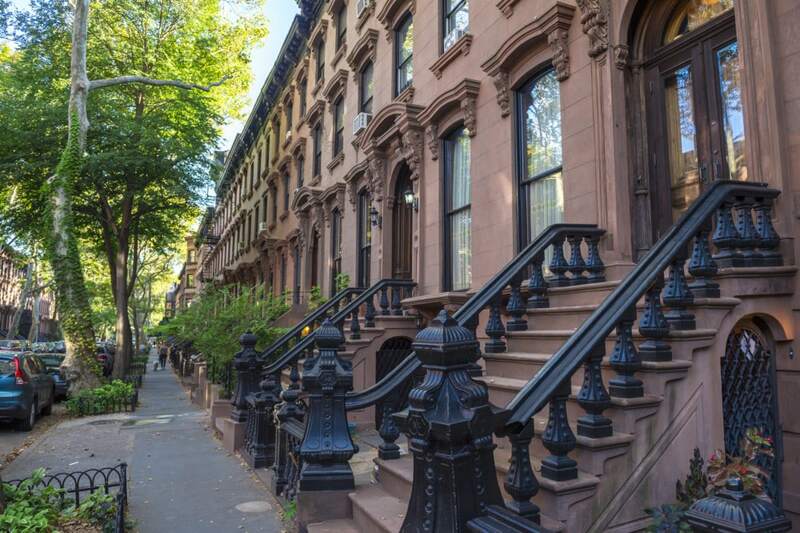 How did brownstones come to symbolize wealth? Let’s get one thing out of the way first. Only a small part of brownstone townhouses are actually made of brownstone. Most of the structure is made out of brick with the outward façade being made of brownstone. Despite brownstone homes giving off an idea of permanence, they’re actually anything but. The material is very soft and liable to crack and crumble over time, especially in NYC’s weather. But this softness makes it easy to cut and work with which is one reason why it became so popular. The rock itself is a type of sandstone which is pink when first cut. Eventually, though, it deepens into its classic brown hue once it’s been exposed to the air. Almost all of NYC’s brownstones got their material from the same place, the Portland Brownstone Quarry, formally located in Portland, Connecticut. Some of it also came from a quarry in New Jersey but the majority came from Portland because of the ease of transport down the Connecticut River. The Portland quarry remained in operation until the 1940s when it was closed due to extreme flooding. it reopened on a limited scale in the 1990s only to be closed for good in 2012 (more on that below). The material first became fashionable in the 1840s for row house facades. Its popularity was due to the rise of Romantic Classicism which glorified picturesque nature. At this time, industrialization and urbanization were increasing rapidly. This art movement was a response to that with the brownstones organic hues recalling the power and beauty of the wild. It was also reasonably affordable at the time, certainly much more so than limestone, granite or marble. Steam-powered machinery made it possible for workers to carve and trim much faster than before which made it affordable enough for middle-class residences, not just the super-rich. For a small investment, homeowners could have a beautiful six-inch brownstone façade, complete with rising staircase, stoop and whatever carved accouterments they desired. Another reason for its popularity is that brownstone could be laid in long sheets with almost invisible seems. This created a unified visual effect which is what developers were looking for in these new row houses. Brick-front row houses, with their stark white motor-lines between each brick, were far less visually appealing. Yet for all its popularity from the 1840s to 1890s, the material was a problem right from the start. The rough NYC weather took its toll on the soft material and expensive maintenance was required (and is still required) every few years. Despite all that, it didn’t really go out of fashion until the Portland quarry was flooded in the 1940s which put a stop to all production of the brownstone. 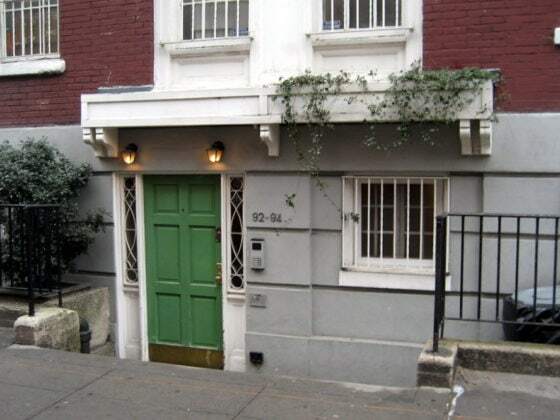 So if brownstones became popular because they were cheap, why are they so expensive now? The answer is one word: scarcity. As mentioned above, the Portland quarry was closed for good in 2012 after 300 years of use. Even when it was reopened it was only operating on a small scale as most of the quarry was still flooded. Once it was announced that the quarry would close for good, stone fabricators began scrambling for as much of it as they could find. Although the brown sandstone is still quarried in a few places around the world – Britain, China, and Utah – experts say that there is really nothing like the stone that came from Portland quarry. It’s not just that the material is now scarce, the style itself has gone out of fashion. Many so-called brownstones are actually a pseudotype with a front coating of brown stucco or, even worse, paint. 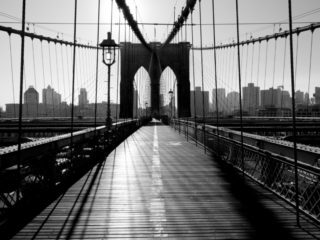 Only a few areas of New York have the genuine variety with the Upper West Side, Fort Greene, Park Slope, and Carroll Gardens having the most authentic and picturesque. As it’s now impossible to build more, the demand has exceeded supply which is why they are now so expensive. 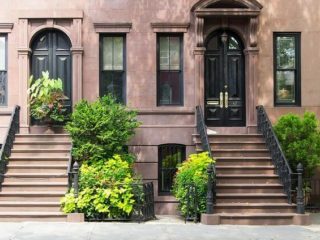 Despite being costly and requiring regular maintenance, brownstones still remain much sought after. They have numerous advantages compared to an apartment and provide you with a little privacy in an otherwise crowded city. John English is a freelance writer that specializes in real estate and travel. How Will Technology Change the Real Estate Industry in the Next 20 Years?